Martin Brodeur became the second goaltender in NHL history to win 500 games when the Devils defeated the Philadelphia Flyers 6-2 on Saturday night. The fourth time was the charm for Martin Brodeur, who became the second goaltender in NHL history to win 500 games when the New Jersey Devils defeated the Philadelphia Flyers 6-2 on Saturday night. Brodeur joins Patrick Roy, the all-time record-holder with 551 victories, as the only NHL goaltenders to reach the 500-win mark. Brodeur got his 500th victory in his 900th career game; Roy needed 933 games to reach 500 wins. Brodeur improved to 500-273-105-15. Brodeur, 35, had lost three consecutive starts after getting his 499th career victory by beating the Flyers 4-1 on Nov. 8 — including a 1-0 home loss to the New York Islanders on Friday. Even with the victory, Brodeur is just 6-10-1, the worst start of his career. But he’s still on track to pass Roy sometime next season. The Devils, who’ve been mired in a scoring slump, gave him an early cushion on Saturday with first-period goals by Dainius Zubrus and Karel Rachunek. Zubrus scored his fourth of the season on a short wrist shot from the left of Martin Biron at 10:04, just as a power play was ending. Rachunek’s first goal of the season was a blast from just inside the blue line that Biron simply missed at 12:47. 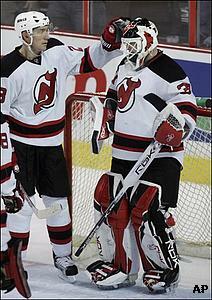 “It was great to get off to a good start,” Brodeur said. The Devils made it 3-0 at 3:33 of the second period when Patrik Elias banged in a rebound after Biron stopped Johnny Oduya’s point shot and Zach Parise’s rebound ( 700K ). Brodeur kept the Flyers off the scoreboard until Mike Richards scored off a scramble at 15:54 ( 700K ). Philadelphia pressed after the goal and Brodeur made a big save off Scott Upshall on a broken play with just over two minutes to play in the period. The Devils came back on the return rush and made it 4-1 when Jay Pandolfo’s wrist shot from the left wing caught the short side and beat Biron at 18:18 ( 700K ). Brodeur had 15 saves through the first two periods. The Flyers changed goaltenders prior to the third period, replacing Biron with Antero Niittymaki. The change seemed to energize them as Richards controlled the puck in the left circle and fed Upshall, who beat Brodeur with a wrist shot from the slot at 27 seconds ( 700K ). But the Devils quickly regained control when Brian Gionta came down the left wing and chipped a backhander from below the circle that fluttered end-over-end and went over Niittymaki’s shoulder at 2:33 ( 700K ). Parise made it 6-2 just 42 seconds later when he snagged his own rebound and backhanded it through Niittymaki’s legs ( 700K ). Brodeur’s best save of the night came midway through the final period when he dove across the crease and made a backhand glove save on Danny Briere’s rebound shot ( 700K ), which appeared to be headed into a wide-open net. Briere appreciated Brodeur’s accomplishment in getting his 500th win — if not his timing. "I know it is pretty special for him, but I wish it was another night," he said. The loss was the Flyers’ first in regulation at home this season. Philadelphia won its first six games at Wachovia Center before losing 4-3 in a shootout to the New York Rangers on Thursday. The victory was Brodeur’s second this season in three decisions against the Flyers. He has 38 wins against Philadelphia, the New York Rangers and the New York Islanders, the most he’s beaten any NHL team, and is 12-1-1 in his last 14 starts against the Flyers. Brodeur grew up watching Roy, who began his career with Montreal in 1986. Brodeur was the Devils’ first pick in the 1990 Entry Draft and won his first start for the Devils, making 24 saves in a 4-2 victory over Boston on March 26, 1992. The first of his 92 shutouts came on Oct. 20, 1993, when he made 17 saves in a 4-0 victory over Anaheim. The Montreal native shared time with Chris Terreri as a rookie in 1993-94, winning the Calder Trophy with a 27-11-8 record and a 2.40 goals-against average. He got the majority of the work as the Devils advanced to Game 7 of the Eastern Conference semifinals. Brodeur took over as the starter in the abbreviated 1994-95 season and led the Devils to the first of their three Stanley Cups. Brodeur has won at least 37 games in every season since 1996-97, and his six 40-win seasons are the most in NHL history. He set the single-season record for victories in 2006-07, winning 48 games in 78 appearances, the second-highest total in league history. He also won his third Vezina Trophy in four seasons. Ironically, the record-setting win also came in Philadelphia, on April 5, 2007. “With the last two things I had to break, I guess Philly’s home,” Brodeur said with a chuckle. This season has been tougher. Brodeur entered Saturday’s game with a 2.74 goals-against average and a .892 save percentage. His lowest full-season save percentage is .902 in 1994-95, and he’s never had a goals-against average higher than 2.57, in 2005-06. His 2.21 GAA entering Saturday’s game is the lowest of any NHL goalie in the modern era. Brodeur is regarded as perhaps the best puck-handling goaltender in NHL history, saving his defensemen countless wear and tear by playing dump-ins and moving the puck away from forecheckers. He has 28 career assists and has been credited with two goals, a regular-season tally against Philadelphia on Feb. 15, 2000, and one in the playoffs when he shot the puck into an empty net against Montreal on April 17, 1997.